Since 2002 ABD has been the local industry leader in providing clean, efficient and reliable beverage container recycling to the hospitality industry. 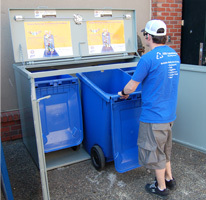 Our “Clean Cart System” has become widely regarded as the standard for cleanliness in recycling services. As a grassroots business our founders’ experience within the restaurant industry provided the inspiration for our customer service approach. We are absolutely committed to extending the same quality level of cleanliness and service that you apply to your business. In 2005 ABD partnered with Encorp Pacific and Return-It to become the first industry recognized service of its kind. Today we service over 400 different locations throughout Greater Vancouver and help to facilitate the annual diversion of millions of containers from landfill. By introducing our “Clean Cart System” to our Non-Refundable Mixed Container Program ABD has once again set the standard for service excellence within the industry. Because we care! We take pride in the work we do and the people with whom we work. We want you to have the best possible experience when it comes to the handling of your recycling. Given the opportunity to service your recycling needs we can guarantee that we will work every day to exceed your expectations. Copyright 2010 ABD Solutions Ltd.